We’ve needed a few days to recover! But better late than never with a few of our favourite things from our weekend in Toronto at The Interior Design Show (IDS14). So much is from Studio North, which was really packed full of great people showing inspiring work. Welcome to the first edition of Galerie CO’s Proust Questionnaire! The Proust Questionnaire is a questionnaire about personality designed to discover new things about old friends. It is named for the French writer Marcel Proust, whose responses to a series of questions posed to him made it popular as a form of interview. Galerie CO has adapted and shortened the original for our blog. Maude: Maximizing materials and respecting people and nature. Maude: A white square on white background. Galerie CO: Who are your favourite designers? Maude: I have no memory for names, I like ideas. Maude: Cutting hair for my dolls. Maude: Sheesh, a cabin in the woods with my dog and my boyfriend, with a barn where I can make things. We’ll be keeping great company from our home province at Studio North during Toronto’s Interior Design Show (IDS14) next weekend. Lots of our neighbours will be making the trip down the 401. We’d like to introduce a few who we work with and/or whose work we just admire. They’ll be showing in Studio North as part of a design collective called QC Design. We’re looking forward to seeing everyone and to meeting interesting people from Québec and from other parts of the country! Galerie CO owner and founder, Sarah Richardson, and her social media manager, Lee-Anne Bigwood, had a chance to sit down with Maude Eloïse Bouchard Furness just before Christmas to have a chat. They started to plan their trip to Toronto for the Interior Design Show (IDS14) and discussed the origins, inspirations and processes of Maude’s design work that will be exhibited at Studio North. From rifling through the sewing box at her grandmother’s house in Northern Quebec to inventing new ways to use scrap pieces she finds on her Montreal studio floor, Maude has always maximized her resources and minimized waste. She has taken this natural tendency, infused it with her creative energy and her passion for her home province to produce a sleek, fresh, distinctive collection of contemporary furniture. Remarkably, she accomplishes all this using sustainable methods at every stage of the process. Maude’s pride in her creations is evident and infectious. Galerie CO: Can you remember how or why you first started to create? Maude: When I was little I started with my grandmother to make little puppets out of balls of wool. We would use old clothes, sweaters and other materials to make the dolls and their dresses. It was more than that though. My mother worked, so I was with my grandmother a lot. We were in a big house in the country. When we weren’t playing outside, she would really encourage us to create. There was a big sewing box full of supplies for us to use. We’d trace images onto paper with glue, and stick pieces of wool to make art pieces. It’s a new year, and we’re getting ready for our first road trip. Galerie CO will be at the Interior Design Show at the Metro Toronto Convention Centre (IDS14) from January 24 to 26. At Studio North, we will be representing Maude Bouchard Furness of Montreal’s Atelier HOCH and introducing her fabulous collection of furniture to the world! 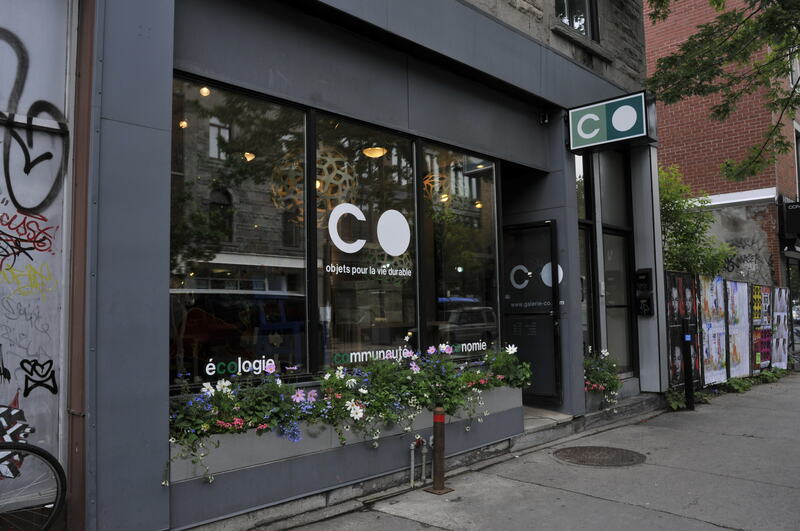 Welcome to Chez CO, the official blog of Galerie CO. Galerie CO is a unique retail destination for home decoration and design inspiration, located in the Mile End district of Montreal. When I opened Galerie CO, I was fuelled by a passion to create a business that would let me bring together my love of art and design and my professional background in international trade and sustainability. To me, sustainability means finding innovative and imaginative ways to build stable economies that respect the environment and improve the lives of people and communities. That’s why we are called CO. The ‘C’ and ‘O’ represent the two letters common to the three words that are fundamental to sustainability — economy, ecology and community. At CO, we are interested in how and where these three elements can weave together.